Enjoy days filled at the hotel with as much or as little fun activities as you wish. A variety of fun activities are available all day round at Caravia Beach Hotel for all. Feel pampered as you enjoy a customized massage, al fresco, in a secluded garden corner or feel the adrenaline rush while catching the waves, windsurfing. Caravia Beach Hotel offers and ideal environment for families as well as couples. Elaborate gardens, with three large swimming pools and a wonderful sandy beach offer a fantastic and safe environment to reconnect with your children and play as a family. Mini Golf is yet another fun -filled activity and for those who love tennis, a floodlit Tennis Court, is ready for you, while hiring of tennis equipment is also available. Discover table tennis, cards or even billiards for fun times with family and friends. 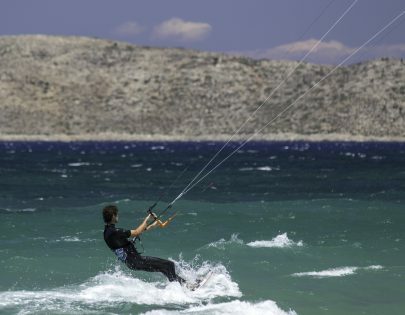 Water enthusiasts can indulge in windsurfing, kite surfing and much more, all handled by individual third party operators at an additional charge. From water sports, basketball, tennis, beach volley, mini golf, table tennis, billiards and more. Additional services are also available at an extra charge. Discover many great adventure opportunities around Caravia Beach Hotel. 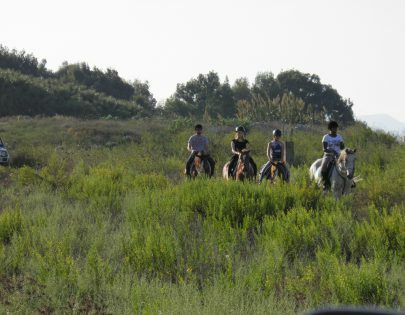 Nearby the hotel you will find a number of activities on offer by individual third party operators, like go-karts and the unique experience of horseback riding , exploring the surrounding natural environment. Watch wonderful sunsets in the warm summer evenings and the unique experience of riding under a full moon. You can also cycle through the Alykes Lake Natura reserve that is close by, and enjoy the quiet countryside the island has to offer. Fun, Action and Sun are what your days are made of at Caravia Beach Hotel.